...that Dr. Halsey's personal journal was retrieved from SWORD Base by the Office of Naval Intelligence? This article has new content coming soon from Hunt the Truth, and may not be complete, confirmed or correct. Please update it as soon as any relevant and accurate material is available. "For the first time in my career I can honestly say I don't know the shape of where this is going. And in fact, the possibilities have me lying awake at night. But I believe we all deserve to know the real story. We need to know where this leads. I know I do." Benjamin "Ben" Giraud is a journalist and a war photographer who for a time worked as a civilian contractor for the Office of Naval Intelligence's Section Two. During the Battle of Mombasa in October 2552, he witnessed Spartan John-117 "saving humanity". This led Giraud to undertake a series of biographical interviews about the Master Chief in 2558. During his investigation he found several inconsistencies between the people he found on his own and the ones given to him by ONI. He soon discovered that ONI's sources were fakes to hide the fact that they kidnapped children to become supersoldiers. Giraud decided to go against ONI and give the public the true story of the Master Chief. In his final try to reveal ONI's tyranny, Ben tried to reveal the organizations secrets on ECB News but soon realized that ONI was in control of the interview and made him seem like an insane conspiracy theorist. He was taken by ONI and is being held hostage in Midnight Facility. Giraud's friend Petra Janecek continued his audio log series until she was later captured. "I was little proud and maybe a little guilty too. Because I knew the truth about the Covenant. But why should I feel bad about helping to deceive people on Earth? The war was hundreds of light years away... And besides, they were paying me very good money." — Benjamin Giraud reflecting on his job. For years Benjamin Giraud covered human-interest stories on Earth and in the Inner and Outer Colonies. He also contracted for the Unified Earth Government and the United Nations Space Command, covering military affairs. By 2552 he worked for the Office of Naval Intelligence in the city of Mombasa, Kenya, on Earth. Ostensibly a public relations consultant for AMG Transport Dynamics' Hog, he actually helped alter battle footage to keep the public unaware of how badly the UNSC was losing the Human-Covenant War. "They think this is the attack, that we can fight back, defend the city. But I've seen how the Covenant troops operate... The city was already lost; we're all dead. Because the Covenant come not to dominate or to colonize, but to destroy." — Benjamin Giraud, as civilians attempt to defend New Mombasa. On October 20, 2552, Giraud was injured during the Prophet of Regret's invasion of New Mombasa. He fell in league with a small civilian resistance group trying to hold the Covenant back until Marine reinforcements arrived. He recorded and translated an order from a Sangheili to clear the area before the Covenant could access something called "the Ark". A Marine sergeant ordered Giraud to get the recording out of the city to the Office of Naval Intelligence. He was about to board an evacuation boat but stopped when he saw a lone young girl crying. Giraud calmed her down and handed her his laptop with the recording in it. He presumably asked her to give it to the authorities when she got to the mainland. He remained in the city where he observed the Covenant invasion in a room full of displays. During the invasion he met fellow reporter Petra Janecek and the both of them witnessed Spartan John-117 fighting against the Covenant. Giraud was eventually able to find a way out of New Mombasa before the city was glassed. ONI's letter commissioning Giraud to write a bio on John-117. "When I pulled that first loose thread, something broke. Now everything is caving in and I find myself stuck with all these ugly questions, questions I never intended to ask. Fabricated histories? People who aren't who they say they are? Cover-ups of cover-ups? That steady drumbeat of theories that used to sound insane, now they don't seem so '"out there". And these disturbing rumors, reports of anomalies. Something big is happening in deep space, and I can't even corroborate a single fact about one man's life. It's clear to me now. I can't fix the pretty story, but maybe I can break the ugly one." — Benjamin Giraud on his investigation of John-117. Giraud kept a low profile after the Covenant War until he was hired by ONI's Senior Communications Director Michael Sullivan to write an in-depth profile on the Master Chief in 2558. Giraud eagerly accepted the offer, and spoke with several people who claimed to know the soldier. As he accumulated the information, though, Giraud started to sense something was off and began finding hints of coverups. The data he received was leading him to a story not as inspiring nor heroic as the "blockbuster hero biography" he'd been intending to write. Giraud, uncertain about the veracity of his data, resolved to establish the truth and perhaps discredit the dark rumors associated with John-117. Giraud was provided with a list of people to interview by ONI, including John's purported childhood teacher, Deon Govender. Govender described his experiences with the future Master Chief up until age thirteen when, according to him, Elysium City was occupied by Insurrectionists who rounded up the citizens in prison camps. Giraud did find one interviewee outside of the list ONI had given him; Ellie Bloom, one of John's childhood friends. After he discovered a document supposedly proving John's death at age six in 2517, Giraud contacted Sullivan about the discrepancy. Sullivan insisted that this was due to a record-keeping mistake and in order to convince Giraud about the veracity of ONI's story, he arranged Giraud to meet Vice Admiral Gabriella Dvørak aboard the UNSC Unto the Breach for an interview; Giraud noted the unusual amount of hospitality he was treated to during the visit. Vice Admiral Dvørak corroborated ONI's forged background story for the Master Chief, recounting her supposed encounter with a thirteen-year-old John during the liberation of Elysium City from Insurrectionist occupiers. While initially convinced that the document listing John as deceased was due to a mistake, Benjamin was prompted to investigate the matter further upon Ellie Bloom's childhood friend Katrina's insistence that John had indeed died at six years old. Having uncovered more distressing facts about the Master Chief's past, namely information on the boxing incident involving several ODSTs aboard the UNSC Atlas, Giraud confronted the supposed Insurrectionist prison camp survivor Thomas Wu and had him implicitly reveal he had been lying previously about Elysium City being home to one of the camps. However, their conversation had taken place over Waypoint, which was under ONI surveillance. Several hours later, he was called for a mandatory meeting at ONI's headquarters in Boston. Before this he met with his colleague Petra Janecek, who chastised him for calling ONI's official story into question. At Janecek's advice, Giraud uploaded the files on what he had gathered to his trusted friend Ray Kurzig before the ONI meeting. 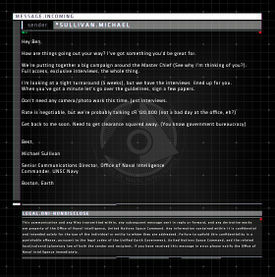 Michael Sullivan initially gave no indication of being aware of Giraud's Waypoint conversation with Wu; Benjamin was even given an exclusive interview with SCPO Franklin Mendez, the man who trained the Spartan-IIs. After the session, however, Sullivan gave him a strict deadline of 24 hours to deliver the raw files of his story to ONI, giving him no time to pursue his unsanctioned investigation further. This led Giraud to suspect that his conversation had indeed been flagged. Despite this, Benjamin intended to finish the job ONI had given him and bury his off-the-record investigation. While on his return trip home, Giraud spotted a man he recognized as Jakob Walker, one of the people he had interviewed previously. Because Walker had claimed he was permanently residing on Castellaneta, Benjamin began to question him but he was ordered to sit down by the flight crew and eventually sedated when he persisted. After returning home, he discovered that he had been fined 50,000 cR for the incident. However, he noticed that his COM pad had been recording during the entire flight. Listening to the recording, Benjamin found that ONI agents had been shadowing him and given him another dose of the sedative to put him to sleep, then taken custody of him during the flight. Furious about ONI's treatment of him, Benjamin decided to continue his investigation and upload all of his findings online for the public to see in a "part docu-diary, part audio archive". After publishing his findings, Giraud began to receive a plethora of theories and responses from across human space. While he was meeting with Ray Kurzig regarding his investigation, Petra Janecek stormed Benjamin's apartment, furious about him recording their conversation on Earth and releasing the recording to the public. Kurzig and Janecek eventually left, intending to distance themselves from the entire matter. However, one of Giraud's contacts, conspiracy theorist Mshak Moradi, revealed that someone nicknamed "FERO" was about to get into contact with him. Three weeks later, FERO had not contacted him, and Giraud failed to communicate with Moradi. Later, Giraud met with Kurzig at a bar; Kurzig had found out about the truth of Jacob Walker, that he was an actor and the only soldier not retired nor discharged. After returning home, Giraud contacted Anthony Petrosky and the two had a conversation about ONI which later led into the shadows of the SPARTAN-II program. Petrosky revealed what he had heard; how the 6-year old candidates were kidnapped and replaced with clones, then being biologically augmented. When Giraud asked about how ONI would react, Petrosky simply told him he didn't owe them anything. Shocked from what Petrosky had told him, Giraud hung up and sat in shock at ONI's lack of humanity. Later in the night, FERO finally contacted him. FERO informed him about the anomalies Mshak had told him before. Afterwards, FERO informed him about 'friendly ears' within the UEG; there was an upcoming committee between UEG senators and superior officers of ONI. She kept telling him that Giraud needed a headline, to start 'a slow burn' that would be ignited into a 'fire' by Giraud's exposure of the truth behind the SPARTAN-II program. One morning, Giraud was contacted by Janecek about the public going berserk about something he had apparently leaked. Upon realizing that he was not responsible, Janecek simply told him to check his feed. When Giraud did, he found a leaked report on Master Chief apparently killing innocent civilians. Before he could do anything, Waypoint was suddenly cut off. His com-pad ran into customer service and appointed a meeting to discuss "on-sight diagnostics" in twelve days and then disabled all its services. Realizing this as ONI's attempt to shut him down, Giraud gathered some essentials and left his home and moved to an undisclosed location. After setting up, Giraud found a message from Moradi, telling him to call him. Giraud called Moradi, who told him that the Inner Colonies wanted the Chief dead and that tensions were heating up in the Outer Colonies. Moradi had compiled all cases of exotic pediatric autoimmune disorder (the same disorder John's clone developed) and created a relatively accurate star map showing the distribution of selected Spartan conscripts. The map suggested ONI heavily favored the Outer Colonies when selecting candidates, leading Giraud and Mshak to believe ONI did this due to it being easier for them to cover their tracks. Moradi then told Giraud about two Spartans who committed suicide after encountering their clone. Later, FERO contacted Giraud again and explained the situation. She told Giraud the Chief would eventually be vindicated and that when that happened, ONI would suffer from it. Giraud was told the meeting with the UEG senators and ONI brass has been scheduled and that when the time came, FERO would hack in and get Giraud an unbroken feed to tell the senators what he had found. Giraud called Anthony Petrosky and asked him if he wanted to help corroborate his story when breaking it to the senators, to which he agreed. FERO informed Giraud there was one more leak, security camera footage of the Master Chief attacking the human delegation on Biko. With Anthony Petrosky's recollection of the events on the UNSC Atlas recorded, Giraud anxiously awaited Moradi's evidence to show to the senate. Moradi finally sent the files, including a recording of police radio when the Spartan who encountered their identical twin was found dead from a self-inflicted wound. Moradi told Giraud to find out what was going on in the Outer Colonies as soon as he can, but FERO cut him off. FERO told Giraud she had hacked into the meeting and that once he was ready, he could start. FERO patched him through and Giraud introduced himself and told them the purpose of his announcement, and then played Petrosky's statement. Giraud then told the senate of the kidnappings, cloning, training and biological augmentations that the SPARTAN-II program comprised of, just in time before the feed was cut. FERO informed Giraud that he was now under her group's protection. Shortly after, Giraud received a message from his bank, informing him his account had been disabled. Giraud also found a message from Moradi, telling him he would meet him the day after tomorrow to tell him something important. Not willing to wait for Moradi, Giraud tried to call, but he found he could not get through to him, or anyone in the Outer Colonies. A delayed message from Katrina arrived. Katrina told Giraud that there is violence breaking out all over the Outer Colonies, but Katrina was cut off. Giraud had no choice but to wait for Moradi, but he never arrived. Giraud, with no choice but to stay put in fear of capture by ONI, secluded himself inside his undisclosed hideout. Giraud listened to a speech made by senator Andrew Del Rio, who condemned the Master Chief, and called him the "Fallen Spartan". The tripwire Giraud set up outside the apartment was suddenly set off, catching Giraud of guard. However Giraud quickly realized it was Kurzig. Kurzig showed Giraud a message from the Sangheili delegation at Biko saying that both they and the Master Chief had nothing to do with the massacre, and questioning the UEG for doing nothing while the population of Biko calls for unjust blood. Kurzig told Giraud that the real perpetrators of the massacre at Biko were a group of rebel extremists called Sapien Sunrise. In return for this, Kurzig asked Giraud if he could call Janecek and see what they were saying on Earth. Giraud called her, and Janecek told him she has a lead he might be interested in, Giraud agreed to it and Janecek sent him the details: an anomaly on the glassed planet, Bliss, with a 72-hour time window. Giraud went back to his home to gather the remaining money he had, but when he arrived, he found his entire apartment gutted. Deciding to stay in his apartment, Giraud heard voices outside. Coming to the conclusion that the voices were of ONI agents, Giraud quickly ran into the hallway outside his apartment and hid in a random room, trying to make as least noise as possible. Giraud heard the ONI agents searching for him and he quickly tried to run up a stairway, and was grabbed by the agents, but FERO ran in just in time to kill the agents and then tells Giraud to follow her. They found a place where they could talk, and FERO gave Giraud a bank account with an abundant balance. FERO told Giraud she would be going dark, but Giraud told her to hold out on her plan for a little while. They parted ways and Giraud traveled to Bliss and went to the location. On the way, he was hit by a huge silicate storm but managed to reach the glassed building and kick out a window to get inside. Giraud, realizing the building was an abandoned ONI facility, started to search around. Giraud found an operational relay interface, and to his surprise, he was able to connect his COM pad to the relay. He found recordings from alternate views of the incident on Biko, as well as evidence against his interviewee's stories. He also found details on the SPARTAN-II program and John-117, confirming the rumors Petrosky told him about. Giraud downloaded all the evidence but started getting hit with corrupted files, so he immediately disconnected. With all the files he needed safely with him, Giraud headed back to the settlement. With the evidence he needed, Giraud called Petrosky and asked him to help him once again. Petrosky agreed, and Giraud told him where he needed to go. While heading back on the freighter, Giraud called Kurzig and sent him the files, asking him if he can forward them on to select people. Kurzig, with his wife and daughter off-world to escape ONI, did not have the choice to turn back, and so agreed. Giraud tried to get in contact with Moradi, but once again failed. Later, Janecek called and Giraud told her what he found in the facility and that he planned to expose ONI live on ECB News the next day. Janecek disagreed with his approach, but Giraud assured her he knew what he was doing. Ben imprisoned in Midnight Facility. Giraud successfully arranged to break his story to the public on Charles Kesler's talk show on ECB News. On the show, however, it soon became apparent that ONI had used Giraud as a pawn to discredit the prevailing rumors concerning the SPARTAN-II program. The authenticity of all of his sources was supposedly disproved, with Petrosky unexpectedly claiming his story about the incident aboard the Atlas had been fabricated all along. This, coupled with heavy skepticism from Kesler, cast his story as little more than the ramblings of a conspiracy theorist. In the end Giraud's feed was cut and he was arrested by federal agents. Petra Janecek took over Giraud's investigation some time afterward, vowing not to make the same mistakes as he had. She, too, was apprehended by ONI soon after, however. After his capture, he was imprisoned at Midnight Facility and sentenced to solitary confinement in Cube B-349. Giraud initially suffered from the effects of isolation, being unable to determine whether or not he was awake or dreaming. With no human contact for weeks, Giraud began punching walls and rubbing his head until he bled; sedation gas was used to stop him from doing so. However, ONI decided to use Giraud as a public relations asset, intent on eventually having him serve as a pro-ONI messenger. Sullivan soon arrived at the facility and saw to it that Giraud received proper medical treatment. Changing several protocols to Giraud's benefit, Sullivan supplied him with writing materials. Soon, Giraud stopped causing self-harm, and the facility began using calming music if he started to get violent. Some time later, Giraud was visited by FERO. Surprised to see her alive and in a secured ONI facility, Giruad was glad to see her. However, when Sullivan ordered her to his office, Giraud soon realized that "FERO" was actually an ONI operative named Maya Sankar the entire time, much to his horror and anger. As she left, an enraged Giraud began lashing out against his confinements and sedative gas was released into his cell. Sankar, who felt remorse for her role in Giraud's arrest, was visibly saddened and disgusted by his imprisonment. "Hey, here's a pitch for a campaign! Instead of lying to the public, we just tell them everything! Y'know, rally support, get everyone involved! What's the worst [that could happen]?" — Benjamin Giraud sarcastically argues with his superiors. By 2552, Giraud had adopted a somewhat cynical attitude toward his job, and the pride he took in his work often overshadowed any guilt he felt for deceiving Earth's populace about the Covenant War. However, he still resented the UNSC's control over his work, particularly their demands to further sanitize battlefield photos. Partly to soothe his own guilt, he would often half-jokingly argue with the ONI representatives that the UNSC should simply tell the public the truth about the current situation, only to be reproved with a series of historical examples to justify the UNSC's media policy. After retiring from his media work for several years in the post-war era, Giraud had lost much of his earlier professionalism, a fact that was noted by Petra Janecek who considered him "sloppy". Nonetheless, his years of introspection following the war led to him rejecting ONI's offer to produce another propaganda piece and he instead chose to earnestly pursue the true story behind the Master Chief, whom he had come to consider his personal hero after the Battle of Mombasa. During the Human-Covenant War, Giraud frequently worked in Old Mombasa. Because he had difficulty keeping up with the dialect spoken by the residents, he kept an automated translator running on his laptop when he interacted with the locals. Despite his job in keeping average citizens in the dark, Giraud had no animosity toward civilians and frequently met with locals for photo sales. He demonstrated his compassion for others when he exchanged his spot on a lifeboat with a little girl, letting her escape the city before the Covenant came, despite being initially determined to secure himself a place on one of the boats fleeing from the city. Giraud appeared to be of African descent and his hair was dyed blue. He wore a set of orange sunglasses at all times until they were knocked off his face in the crowd of refugees attempting to escape New Mombasa. 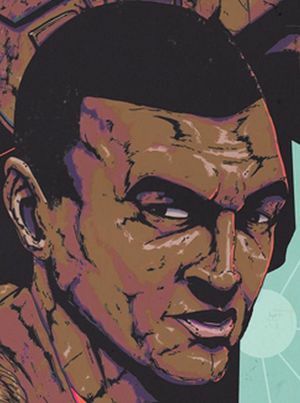 Giraud was first featured in the Halo Graphic Novel story "Second Sunrise Over New Mombasa", although he remains unidentified in the comic. He was not named until being reintroduced as part of the Hunt the Truth promotional campaign for Halo 5: Guardians. His surname is an homage to Jean "Moebius" Giraud, the illustrator of "Second Sunrise", who passed away in 2012. Giraud is voiced by Keegan-Michael Key, an American comedian. Key starred on Mad TV alongside Debra Wilson, the voice of Hocus in Halo 3. Curiously, Key consistently pronounces ONI as the initialism "oh-en-eye", as opposed to far the more frequently utilized acronym "oh-nee". Giraud in Second Sunrise Over New Mombasa. Giraud living in New Mombasa in 2552. Giraud edits war footage to make it appear less grotesque and more "adventurous". Giraud records a Covenant message on his laptop. Giraud hands his laptop to a young refugee and remains in the city. A photo Giraud took of John-117 during the Battle of New Mombasa. ↑ 2.0 2.1 2.2 2.3 2.4 2.5 2.6 2.7 Halo Graphic Novel, "Second Sunrise Over New Mombasa"